Today Mussolini is remembered as a hated dictator who, along with Hitler and Stalin, ushered in an era of totalitarian repression unsurpassed in human history. But how was he viewed by ordinary Italians during his lifetime? In Fascist Voices, Christopher Duggan draws on thousands of letters sent to Mussolini, as well as private diaries and other primary documents, to show how Italian citizens lived and experienced the fascist regime under Mussolini from 1922-1943. Throughout the 1930s, Mussolini received about 1,500 letters a day from Italian men and women of all social classes writing words of congratulation, commiseration, thanks, encouragement, or entreaty on a wide variety of occasions: his birthday and saint's day, after he had delivered an important speech, on a major fascist anniversary, when a husband or son had been killed in action. While Duggan looks at some famous diaries-by such figures as the anti-fascist constitutional lawyer Piero Calamandrei; the philosopher Benedetto Croce; and the fascist minister Giuseppe Bottai-the majority of the voices here come from unpublished journals, diaries, and transcripts. Utilizing a rich collection of untapped archival material, Duggan explores "the cult of Il Duce," the religious dimensions of totalitarianism, and the extraordinarily intimate character of the relationship between Mussolini and millions of Italians. Duggan shows that the figure of Mussolini was crucial to emotional and political engagement with the regime; although there was widespread discontent throughout Italy, little of the criticism was directed at Il Duce himself. Duggan argues that much of the regime's appeal lay in its capacity to appropriate the language, values, and iconography of Roman Catholicism, and that this emphasis on blind faith and emotion over reason is what made Mussolini's Italy simultaneously so powerful and so insidious. 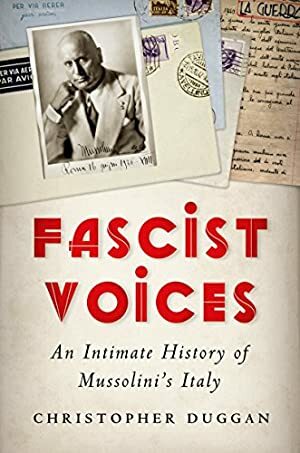 Offering a unique perspective on the period, Fascist Voices captures the responses of private citizens living under fascism and unravels the remarkable mixture of illusions, hopes, and fears that led so many to support the regime for so long. Log In to track Christopher Duggan on eReaderIQ. to be notified each time the price drops on any book by Christopher Duggan. to stop tracking Christopher Duggan. We started tracking this book on June 18, 2013. This book was $14.29 when we started tracking it. The price of this book has changed 41 times in the past 2,131 days. The current price of this book is $14.57 last checked one day ago. The lowest price to date was $13.49 last reached on February 22, 2014. This book has been $13.49 one time since we started tracking it. We last verified the price of this book about one day ago. At that time, the price was $14.57. This price is subject to change. The price displayed on the Amazon.com website at the time of purchase is the price you will pay for this book. Please confirm the price before making any purchases.